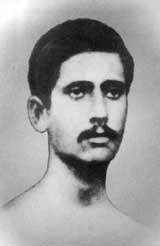 Amongst the three poets, Rabindra nath Tagore, Rajanikanta and Nazrul, Rajanikanta Sen was born in Bangladesh on 26th July 1865, in Bhangabari under Sirajgunge sub-division of Pabna District. His ancestors were of village Sahadevpur under Tangail Subdivision of Mymensing District on right side of Brahmaputra in Bangladesh. His great-grand-mother Karunamoyee was pregnant when his husband, Jogiram, was dead. So she had come to his Brother's residence at Bhangabari (on the other side of the river Brahmaputra) and did not return to Sahadevpur. She gave birth to Golaknath, grand father of Rajanikanta. Due to economic stringency Golaknath could not proceed with his studies to a higher level. But he tried his level best to make his two sons, Govindanath and Guruprasad, well educated. Guruprasad, father of Rajanikanta, passed LLB from Dacca university and became a sub-judge. 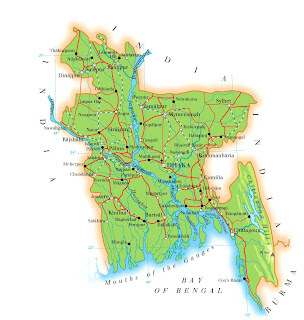 After being posted in different places such as Rangpur, Dinajpur, Bhagalpur, Munger, Kalna, Katoya came to Krishnanagar and retired from that place. While staying at Kalna and Katoa he passed his leisure time by discussing Baishnab Literature. He collected 400 poems of Brajabuli and published a book , PADACHINTAMALA. His elder brother Govinda nath earned a lot of money by praticing law in Rajshahi with reputation and built their retched house into a well built two storyed one. Devotional leaning of Rajanikanta, probably, had come from his father. His mother Manomohini was a good domestic lady with versatile genious. She could cook so well that she was termed a Judge of Cook. She could read and write in Bengali well and studied Ramayana, Mahabharata, Sitar Banabas, Sati Dramma and was fan of poet Hemchandra Bandyopadhaya. The love of literature of Rajanikanta owed to his mother. She was the source of inspiration of writing CHARA in his early days.